I actually made this craft a few days ago, but I had to wait until after Easter because these went into the kids' baskets. Not very Easter-like, I know, but as they get older you have to expand your thinking a bit. I love how these turned out, which made it really hard not to show you right away. My local Craft Warehouse has two shirts that were done using this method hanging in their store and they've been there for months. I don't know why it took me so long to try it. 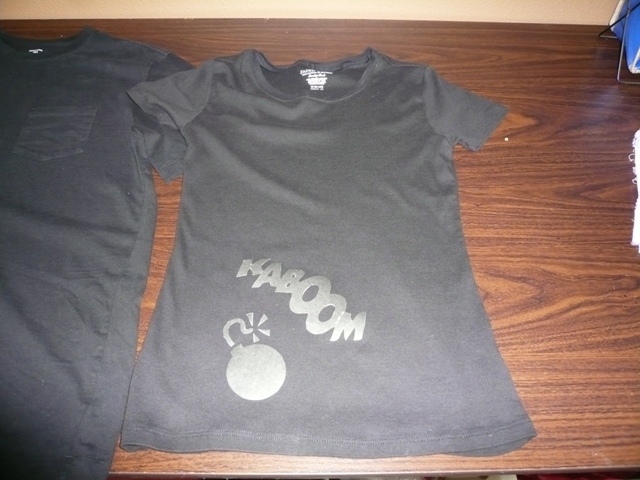 I started out by making freezer paper stencils, similar to the ones for the painted t-shirt here, but opposite. In other words, if I were using a heart, I would cut out the heart and discard the outside. It's actually called a mask, because it covers the area you don't want to change. 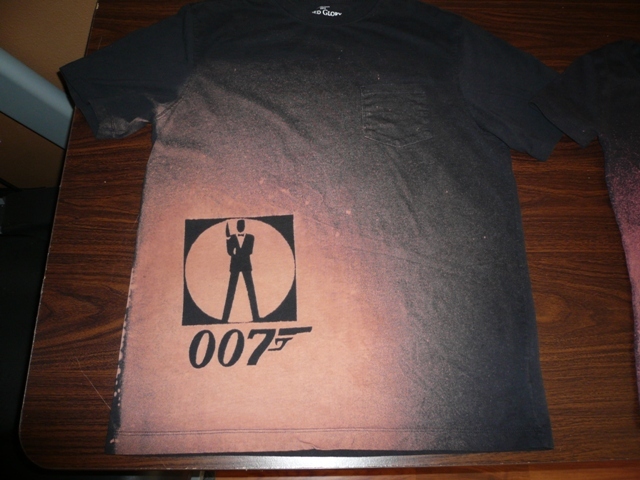 In this case, it will keep those areas of the t-shirt black. I ran the freezer paper through my printer again, still worked beautifully. I am never getting that new printer! I printed one set in black and the other gray, to use less ink. The gray ones were very hard to cut out because it was difficult to see the edge, so I think I would stick to black next time. My only concern there would be the black ink bleeding off onto a colored shirt, so maybe printing in the color of the shirt makes the most sense. I also printed a page with my designs on it for reference so I could piece them together correctly after cutting everything out. 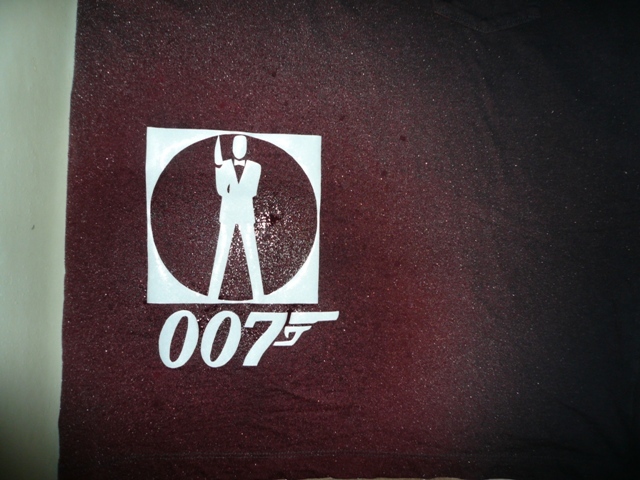 I didn't bother prewashing the T's, which seemed to work out fine. 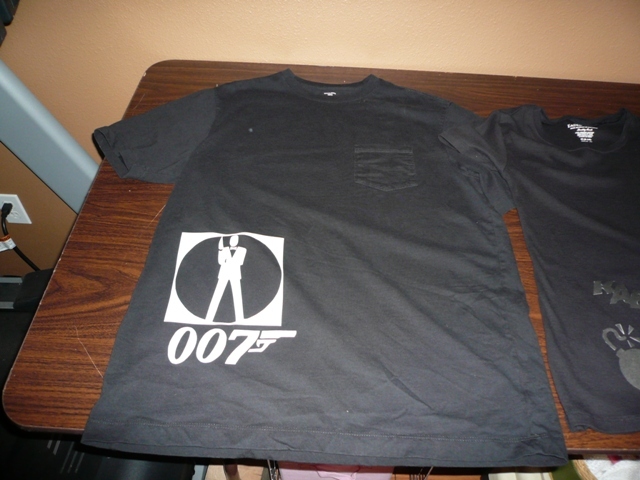 I ironed the freezer paper, wax side down onto the shirts. Except for the tiny piece that I didn't realize was wax side up. That one I ironed to my iron. To prevent the bleach from bleeding through to the back side, I put cardboard inside the shirts. I laid the shirts, one at a time, in the bottom of the bathtub, then sprayed from about 12 to 18 inches away with a mixture of half bleach and half water in a spray bottle. Definitely turn on the fan before this step. Or better yet, do it outside. Bleach tends to make a person a little dizzy. It took a few seconds for the color to change. I let it sit there until I liked how it looked, then I VERY carefully picked it up. The bleach had accumulated on the mask and tried to run off so I held it very level. I dunked the shirt in my kitchen sink into a mixture of one gallon of water and a cup of vinegar, which neutralized the bleach. And yes, the smell is every bit as fantastic as you're imagining right now. I pulled out the cardboard, making sure to not let it touch anything because it's covered in bleach. As I swished the shirt around, the mask started to come loose, so I peeled it off. I would recommend wearing gloves or else you might realize that you cut your index finger yesterday with your rotary cutter and bleach stings. Ouch. After both shirts were done, I threw them in the washing machine and dryer. I would recommend washing these by themselves, as more color may come off. I was surprised at how well the freezer paper worked and how crisp the lines turned out to be. 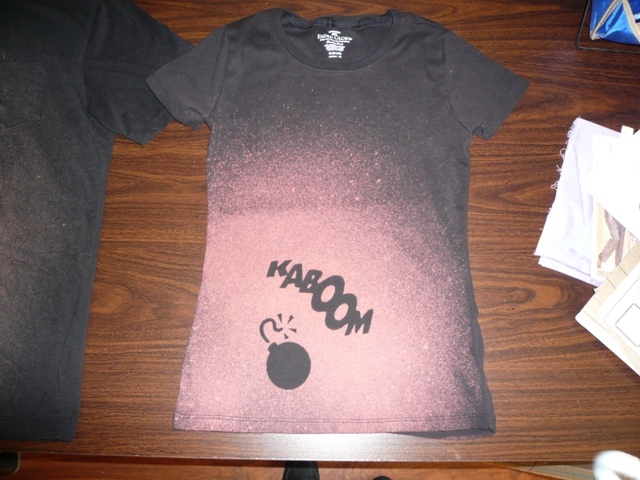 Each of the shirts bleached to a different color, which was pure luck. The girl version is kind of pink and the guy's is more of a rust. Next time I'm going to start with a different color shirt. And I'm going to bleach them outside. I have to go get some fresh air now.